MYAGDI, Aug 25 : A new trekking route is under construction in order to promote tourism in the district headquarters Beni. The trekking route has been named as Mona Beni Lovely Hill trekking route and is being jointly constructed by Beni municipality, Myagdi Overseas Nepal Association (MONA) and Myagdi Chamber of Commerce and Industry. The trekking route leads to the Lovely Hill in the south of Beni and is expected to cost Rs. 5.7 million to complete. 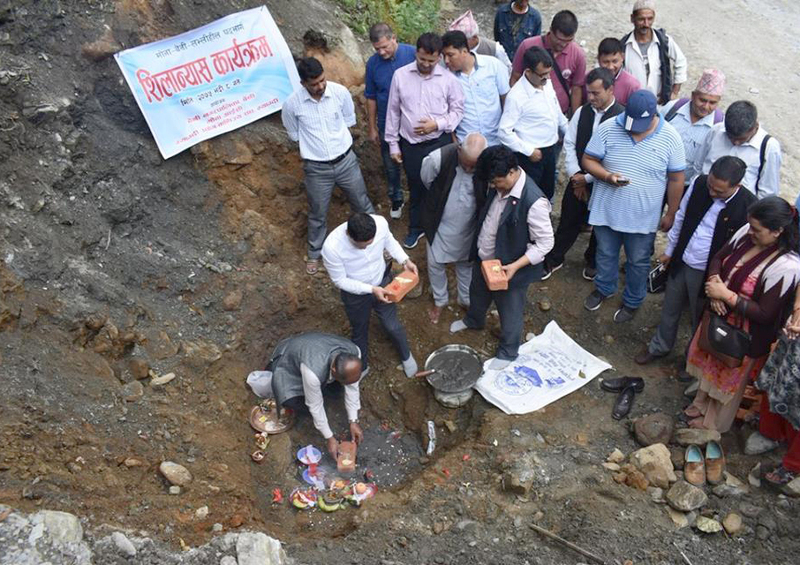 It will be completed and handed over to the municipality in six months, the trekking route construction committee coordinator Uttam Karmacharya said. Boundary wall and a rest place have already been constructed at Lovely Hill that gives a spectacular view of Beni bazaar, Parbat beni, and other rural settlements of Myagdi and Parbat districts. One can also view the mountain range including the Dhaulagiri mountain. The new route is expected to bring in more tourists to the area, ward chair Hira Bahadur Thapa said.